Situated in the heart of Napa Valley, Flying Horse embodies the spirit and degree of excellence that our friends have come to respect and treasure. Our current selection of wines are from a historic vineyard located alongside the Aetna Springs Resort. The unique vineyard terroir of rocky, well drained soils with hot days and temperate evenings produces superior wines in limited quantities such as Sauvignon Blanc, Petite Sirah and Cabernet Sauvignon. The Tasting Room at Napa Wine Company invites you to stop in for a unique wine tasting experience. The Tasting Room offers a comfortable environment where you will be hosted by one of our friendly, knowledgeable staff members who will share with you each producer’s unique story. 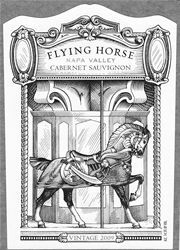 To join the wine club, visit www.flyinghorsewines.com or call 707-965-0800. You will receive pre-release wines and library selections as they become available. Since our wines are in such small production and high demand this will be the best way to guarantee your allocation of wine for each vintage. Seasonal shipments, sent twice a year, will include a case of Sauvignon Blanc or white wine (Spring) and a case of Cabernet Sauvignon (Fall), at a 10% discount. You do have an option to choose reds or whites only. Each shipment will include tasting notes, a newsletter along with an update of the current vintage. Complimentary tasting of our current releases for you and a guest at our tasting room location. Shipping is made available to you at the lowest cost and will be shipped ground or two day air depending on weather conditions. All wine is guaranteed fresh upon arrival. Each shipment will include tasting notes and recipe suggestions along with an update on the current vintage and a note letting you know what we're up to. We will periodically offer exclusive wine tasting events and wine maker dinners in San Diego, Los Angeles, San Francisco and Napa Valley. Join the Flying Horse Wine Club and become a member of our team!